It was a tough month for Bermuda’s social media peeps. The average Klout score from the first quarter’s top 50 rankings fell by an average of two points. Several of the top people took hits of five or more people to their Klout scores. Falling out of the top 10 were PowerGirl Trina and Shari-Lynn Pringle, and joining the Top 10 for the first time is Ledrew Fox who has a strong Twitter following his Christian tweets, while rejoining the top 10 are The Royal Gazette and Don Burgess. Of course, social media juggernaut, WWE and Fox Business commentator John Layfield remains number one and actually saw his score get a slight bump to 85. The rest of the top five were Bernews, singers Heather Nova and Collie Buddz, and the Bermuda Tourism Authority. Christopher Famous, Patrick Caton [8 points each] and Webster Butler [5 points] had three of the bigger gains for the month. All scores were recorded on April 5, 2017. 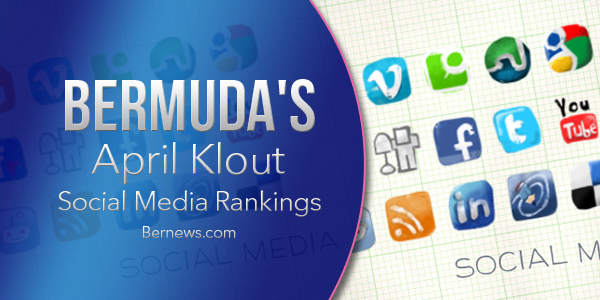 The next Bermuda Klout rankings will be published in July. Don Burgess is the Executive Officer of the media Council of Bermuda and is the former deputy editor of the Bermuda Sun newspaper who has earned certifications in social media and inbound marketing through Hootsuite, HubSpot and Lern Univeristy. If you have a Klout ranking of more than 61 and have a Bermuda connection and were not on this list, please e-mail Don Burgess at dburgesspb@gmail.com. “Falling out of the top 10 were PowerGirl Trina and Shari-Lynn Pringle,…” by choice for me!! Try staying in the Top 10 for 2 years straight without star power! Congratulations all and thanks to all of YOU who contribute to getting us on this list in the first place.